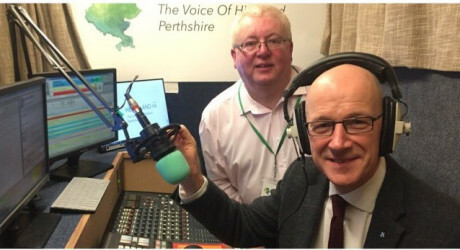 HEARTLAND FM is a community-owned, volunteer radio station based in the heart of Scotland – Highland Perthshire. In 1992, we started as the UK’s ‘original small scale independent radio station’ and today we are recognised as the UK’s oldest community-owned station. In 2017, Heartland FM embarked on a project to move premises – allowing its landlord, The Old Mill Inn, to extend their growing business. The building in which the Highland Perthshire Communities Project and The Highland Perthshire Broadband Project had space and was an obvious solution to house the new studio and office complex. With funding from SSE Griffin and Calliacher Wind Fund, Heartland FM designed and built new facilities fit for broadcasting in the 21st century, with two broadcast studios with a fully-automated playout system using Myriad from Broadcast Radio. Station manager, Alistair Smith, said: “I have been involved in commercial radio for 20 years, but was made redundant in September of last year. Through working on a previous project with HFM chair, Graham Huggins, I began working with Heartland to implement Myriad as the playout system of choice. “As we equipped the new studio, Myriad V5 was being released, so we moved with the new playout, and the latest version. We all had a very steep learning curve and the volunteer presenters all embraced the changes. I have to acknowledge both the support of the presenters and the team at Broadcast Radio which ensured a smooth transition to both Myriad Playout and the new VoIP Phone Hardware and Software from their AEQ system. “We have updated our on-air sound, with a more structured daytime programming complimented by our vast array of specialist music shows, we offer traditional Scottish Music programmes, Country Music, Religious broadcasting to Prog. Rock and Easy Listening, with a special emphasis on Scottish music acts, both past and present. “The challenge was then to produce a contemporary station sound and jingle package to bring the new sound to life. We worked with Chris Stevens, of Ignite jingles, to create a sound which placed us right up to date, and covered all the genres of music we play. Heartland FM chair, Graham Huggins, said: “Our vision is to create a Media Hub approach to broadcasting which will see an integration of tradition FM airtime, social media outlets and distribution, video and audio production and shortly the introduction of an online magazine. This will be closely aligned with a robust, open training programme teaching new skills and improving employability which will see greater community cohesion across Highland Perthshire. Pic: station manager, Alistair Smith, with Deputy First Minister, John Swinney. MEDIA RELEASE issued by Heartland FM. You too can share your stories (aka press or media releases), on this site. Email here for more information.